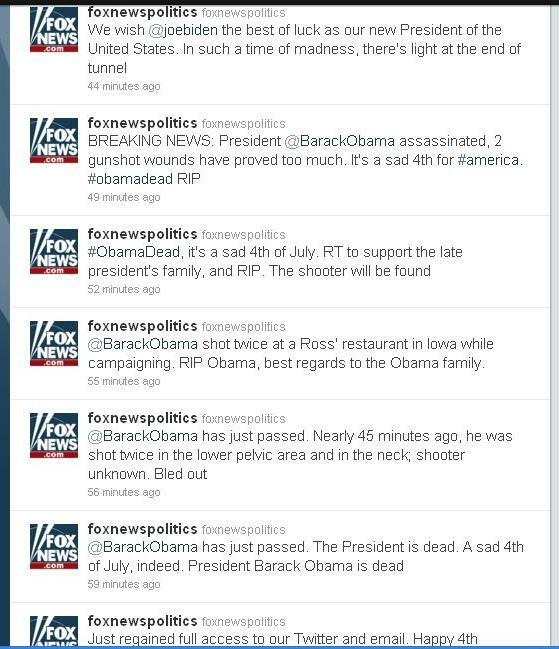 Fox News Twitters Feeds has been hacked last Monday; the hackers tweeted erroneously that Barak Obama had been assassinated in Iowa. About 9 hours after they were posted, the 6 messages were removed from the tweet account. 1) It gives one the creeps ! 2) Maybe he is innocent? This is a nice reading on topic: http://onemansblog.com/2007/03/26/how-id-hack-your-weak-passwords/. Everyone should understand the importance of using a strong password. I'm pretty sure they just used brute force to break in. This is the first time i read the time required to break a password, given the lenght and strength of the password. Very enlightening.